Once these irritants pass through the skin's weakened barrier, they trigger our immune system to respond by swelling the affected area with blood. This inflamed state can be further irritated by certain foods (diary, coffee, soybean, eggs, nuts, wheat, maize, etc. ); temperature and humidity; stress levels; and even intense exercise. Unfortunately, the triggers of this downward spiral of skin irritants are often a normal part of everyday life and hard to avoid. So what are your options? Topical Steroid Creams: Corticosteroids: Again they do not cure eczema, but are effective in controlling or suppressing symptoms. However, over time the results tend to diminish. So people apply the cream more frequently or look for more powerful creams to achieve the same results. Continued use can result in thinning already fragile skin, which further deteriorates the skin barrier; and if you stop using the steroids the results can be devastating. This process is known as: Topical Steroid Addiction and Withdrawal. Antihistamines: Stop the triggering of inflammation and itching but medical research is still cautious to claim this as an effective therapy on its own because it doesn’t treat the skin only the symptoms. Furthermore, antihistamines cause drowsiness and leave you sluggish all day. Antibiotics: Open skin is an invitation to secondary infections. When this happens doctors may prescribe antibiotics. This is not a long term option, in fact, it can make matters worse. Antibiotics kill our GOOD and BAD bacteria, which weakens our immune system, leaving you nearly defenseless against other sensitivities. Moisturizing: Eczema is exacerbated by dryness of the skin. Moisturizing is one of the most important self-care treatments for sufferers of eczema. Keeping the affected area moistened can promote skin healing and relief of symptoms. However, petroleum based lotions with mineral oil tend to leave skin feeling even dryer, and chemical additives, preservatives and fragrances further aggravate the problem. Very few moisturizers actually include bio-nutrients that bolster the skin's ability to restore its own health – but Emu Oil does! Emu Oil for Eczema: Topically, Emu Oil not only moisturizes through many layers of skin but it also delivers bio-nutrients to promote new cell generation, increase blood flow and drain away redness and inflammation. It is full of essential fatty acids, high levels of anti-oxidants, collagen, elastins, vitamins and minerals which promote natural healing and rejuvenate dry, damaged skin tissue. 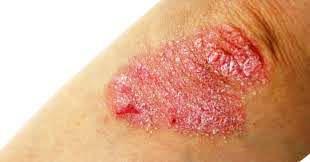 Studies have shown it can thicken the skin barrier an average of 14% (up to 30% in some participants) thereby stopping the entire eczema process in its tracks. Ingesting Emu Oil as a dietary supplement not only brings you a wealth of Omega Fatty Acids but also the catalyst - ATP (Adenosine Triphosphate) your body needs to convert these fatty acids into the specific compounds needed to keep your skin plump, firm and healthy. Sea Salts, Dead Sea Salts, Epsom Salts and Magnesium: Have you ever noticed how a beach vacation can improve many skin conditions? Sea salt contains minerals that our current diets are deficient in such as potassium and magnesium. Magnesium effects general skin lipid health, reduces the body's response to stress and regulates histamine production. Dead Sea Salts offer a much higher concentration of the minerals magnesium, potassium, calcium chlorides and bromides then regular Sea Salt. Epsom Salts are pure magnesium. So try a Dead Sea Salt or Epsom Salt bath and consider taking Magnesium supplements. I also suggest you try the Wellness Mama's recipe for Sea Spray. Apple Cider Vinegar: Apple Cider Vinegar soothes inflammation and relieves itch. It's a great source of potassium and many other minerals, enzymes and bio nutrients important for addressing eczema and it balances the PH level of the skin. It is very important that you get Apple Cider Vinegar with the “mother” a cloudy area full of the bacteria and acids that helped to ferment the vinegar, and equally important that you use it correctly. My suggestions: start a regime that includes both Pure Emu Oil as a topical application and ingesting it with DuoFlex Multi-Omega Gel Caps. Reduce stress; research and experiment with other natural remedies; review your diet and surroundings for allergen triggers and work to improve your gut health and immune system and as always - never give up - the solution is out there for you.